What I did: It rained all last night, which was so good for California. The rain was very calming and awesome to sleep to. This morning was an interesting experience going on the transit – tons of wet bodies in a small space. There was a gal who was wearing glasses and they were all wet (I have these little wet wipes for glasses and electronics that my partner James gave me) so I shoved my hand in my backpack pocket and found one. I gave it to her and she was surprise but totally accepted it. It was so great to do something like that, I love the idea of strangers helping one another. This morning lecture was about chart.js and D3. These are amazing! I’m not sure if I’ll be able to use this for my project, but I defiantly want to play with this! I focused on working on creating my classes (my user class), database and connecting to my routes. I first worked off of my routes where my form data is received and processed (ie. 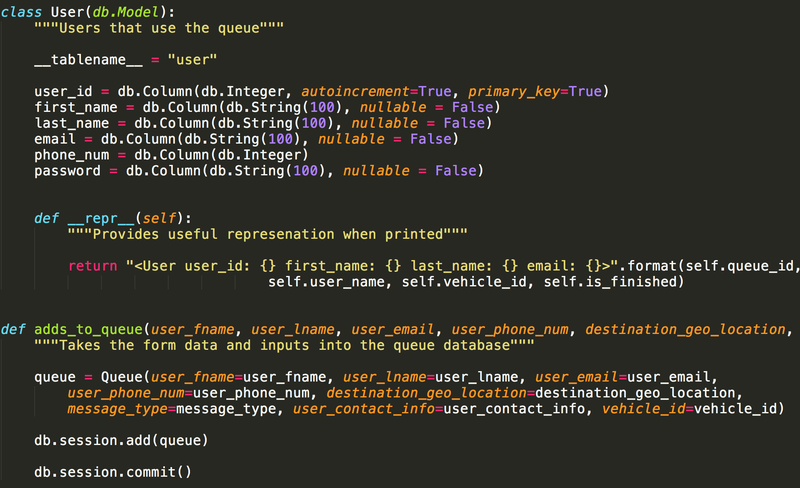 finds the closest vehicle) and then send the data to the database to get saved into my “queue”. Once my data got to that portion, I created my tables using classes in python. Now when there is a request made, it adds the information that I want from my form (from my server) to the database. I had some challenges making my database. I worked on it in both directions for my transit_request. I had already made the class and I had made the the route for the form submission and through out the process I changed ideas. So this was good to because I had to make sure all my variables are the same and that the data was consistent. My Thoughts/Process: Today I was very productive! My mind was clear and I had a plan. I did get lost in my database, model(class), server connecting~ness. I had pieces of each part, but connecting them got messy (I changed one thing but forget to change it in what it was connecting to). I jumped into the queue at hackbright and I got support from Joel and it was a simple: my app route didn’t have “/” in front, so I just had to change “user_input” to “/user_input” and it worked! But I did get lost with the error. I’ll need to remember to breath when it comes to connecting because since there are so many moving parts, I got scared that I wouldn’t know what was wrong (aka, building my confidence in building my awesomeness). Algorithms Lesson: Usually an online course with videos such as the Coursera Algorithms class.